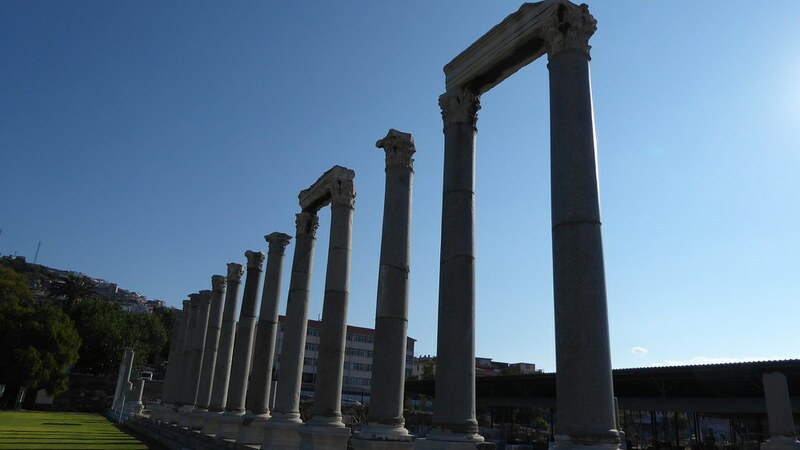 Just before we left Turkey for the summer, we traveled to Izmir (Smyrna), an ancient city on the west coast of Turkey, facing the Aegean Sea. There, we were fortunate to receive a proper tour from a local tour guide. From what we saw, it seems the city for the most part extends across the northern and eastern/southern sides of a bay. 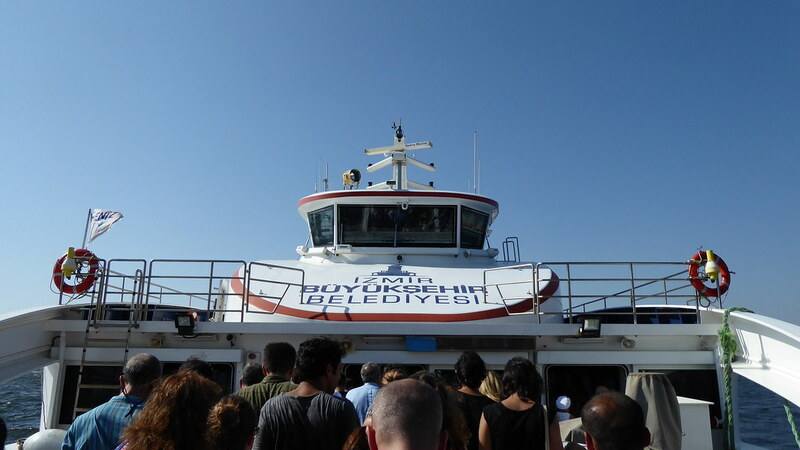 While we were staying not far from the Konak area (home to city hall, a major bazaar, and some of the city’s museums) and the Alsancak neighborhood (perhaps the chief center of live music bars), both of which sit on the eastern end of the bay facing west out over the water, these are connected by ferry boat (vapur) to other major neighborhoods on the northern side of the bay. 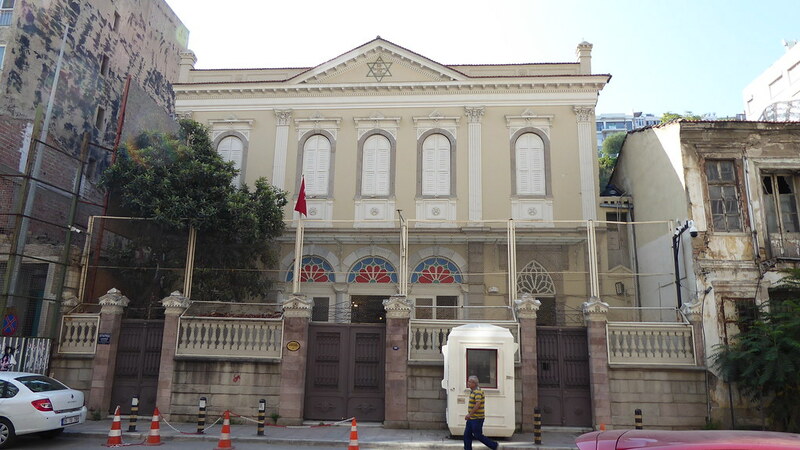 We began on that northern side, at a former synagogue known as Mezakat Arabim in a neighborhood known as Karşıyaka. 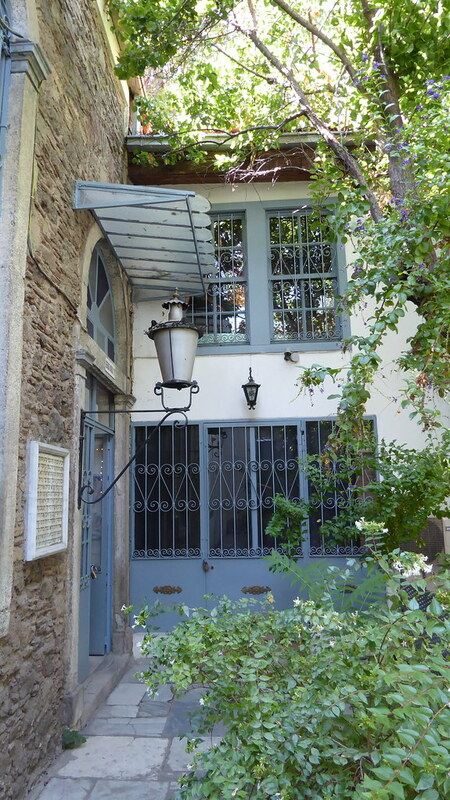 Built in the late 19th c. and out of use since the 1930s or so, it fell completely into disrepair, but was recently turned into a music school by the municipality of Karşıyaka. Free music classes are provided there by the municipality. 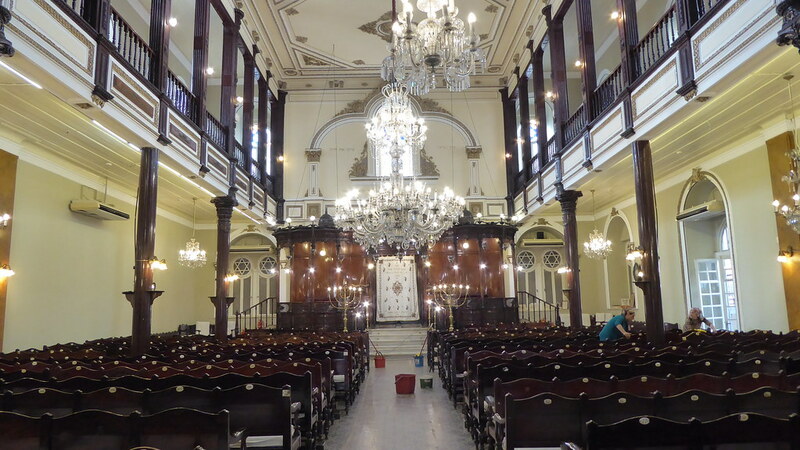 But some parts of the former synagogue, such as the stained glass and aron hakodesh (the “ark” or special cabinet where Torah scrolls were kept) have been maintained or restored. The ark is now used as a regular cabinet, but the original Hebrew letters have been repainted and maintained, and the stained glass is partially original and partially restored. The former synagogue Mezakat Arabim. We learned that Ataturk’s mother spent her last years in Izmir and is buried in Karşıyaka. His wife was also from Izmir. Also, the Greek invasion of Izmir in 1919 is said to have been the final straw on the camel’s back which really sparked Ataturk to go to the Karadeniz (Black Sea) provinces and start his nationalist movement. 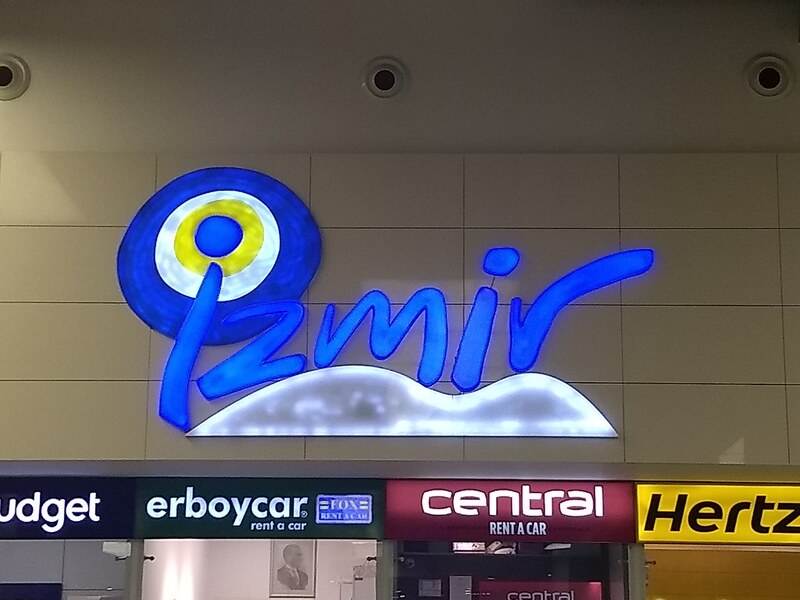 So Izmir claims a certain pride or responsibility in connection to the Republic. Looking at a map, I learned that a number of islands just off the coast of Turkey, just a very short distance from Izmir, are governed/administered as part of Greece. These islands serve as a rather striking example of how arbitrary and ahistorical national borders can be. All of Greece was, of course, part of the Ottoman Empire for hundreds of years, and before that, the entire region was under the Eastern Roman (or “Byzantine”) Empire, which many called or considered “Greek.” It was only at the end of several wars and a massive population exchange that the borders ended up where they are today. Who’s to say whether Izmir (Smyrna), Edirne (Adrianople), Rhodes (today part of Greece but far closer geographically to Turkey), these islands near Izmir, or even Istanbul (Constantinople) itself should rightfully be considered “Greek” vs. “Turkish” territory? What do we even really mean by that when there was no country of “Greece” or “Turkey” for all those hundreds of years? A pretty interesting and potentially eye-opening example for world history courses. As we rode the vapur to Karşıyaka, Tilda told us that the first settlements here came around 6500 BCE. Over at the other end of Turkey, near the Syrian border, is Göbekli Tepe, quite possibly the oldest known, excavated, religious site in the world, dating back as far as 11,000 BCE. As so much of our basic education on the ancient world centers on Greece, Rome, Egypt, the Levant (Lebanon/Syria/Israel) and Mesopotamia, it can be really easy to forget, or to not realize to begin with, just how far back the ancient history of Anatolia / Asia Minor (i.e. Turkey) can go. The next later major settlement was around 3000 BCE. The third was founded by Alexander the Great, who conquered over from the Greek mainland, and through the islands. Later, Alexander’s generals decided to establish a major treasury at Pergamon (about an hour north). Some time later, while the general was away, the guards of the treasury decided to keep it for themselves and used it to start their own Kingdom of Pergamon. That kingdom lasted only about 150 years, but was apparently quite rich both economically and in arts, philosophy, etc. The last King of Pergamon gave his kingdom to Rome, rather than risk being conquered or destroyed or anything. Rome then controlled the area until around the 4th century CE, when Rome fell and Byzantium (i.e. Constantinople, i.e. Istanbul) became the capital of a new Eastern Roman Empire, which ruled until the Ottoman conquests. Over the course of the 12-15th centuries, Turks, Byzantines, Venetians, Genoese, and others repeatedly gained and lost control over parts or the whole of the area around Izmir/Smyrna. The Ottomans then took Izmir definitively in 1424, nearly thirty years before famously taking Constantinople in 1453. The Ottomans were not the first Turks to come to Turkey, though. There were also the Seljuk Turks who, if I’ve got this right, expanded out across Persia and over to the west, conquering much of Anatolia (i.e. Turkey) by the end of the 11th century. They were led at that time by Alp Arslan, who won an important battle against the Byzantines at Manzikert in 1071. Manzikert is one of those battles that I definitely knew the name of, knew it must be of some real major significance in European history, but never knew/remembered what the significance was. Like the Battle of Lepanto. But now, excavations in Beşiktas (a neighborhood of Istanbul) have apparently recently shown evidence that Central Asian (Turkic) peoples may have arrived in Anatolia much earlier than the 11th c (Seljuks). So, that’s something. Sadly, I was only told about this verbally, and don’t have an article to link to or to read to learn more about it myself. The Izmir Clock Tower (Saat Kulesi). 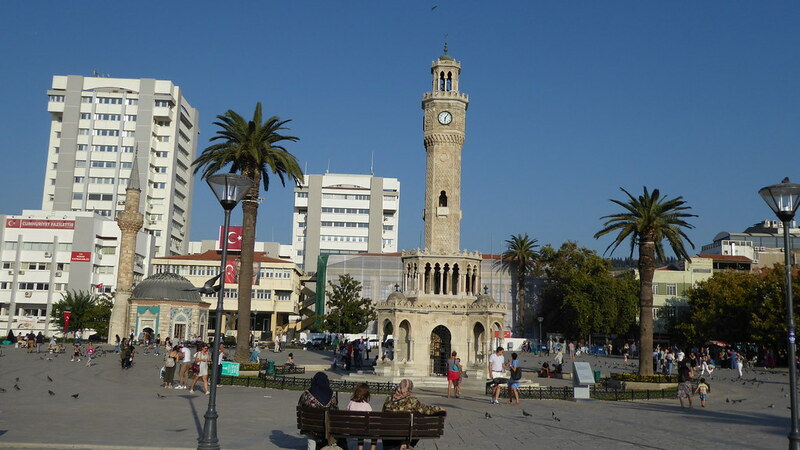 Jumping to the modern period, at this point in our tour we had come to the Izmir Clock Tower, at the center of a major plaza in the Konak neighborhood, which includes Izmir’s chief bazaar and several of its major museums. The clock tower was apparently built in 1901 in celebration of 25th year of the reign of Sultan Abdulhamid II, with the central clock mechanism being a gift from Kaiser Wilhelm of Germany. 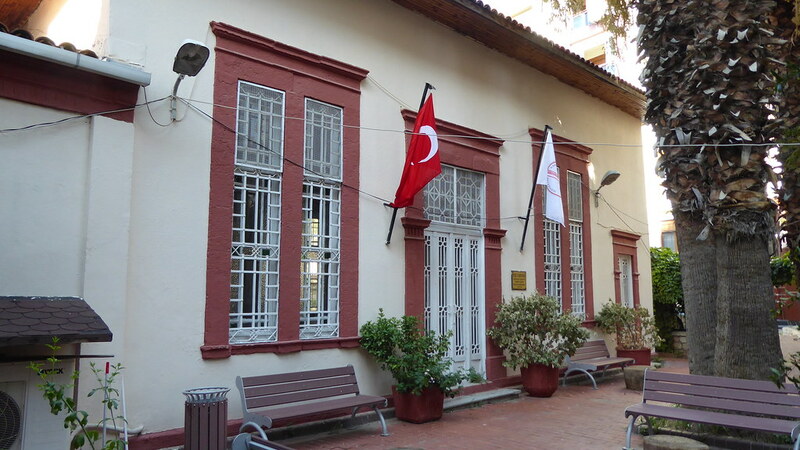 Konak means “mansion.” At one side of the plaza, the former residence/office of the Ottoman governor of the area is now the official government office for the governor of Izmir Province. 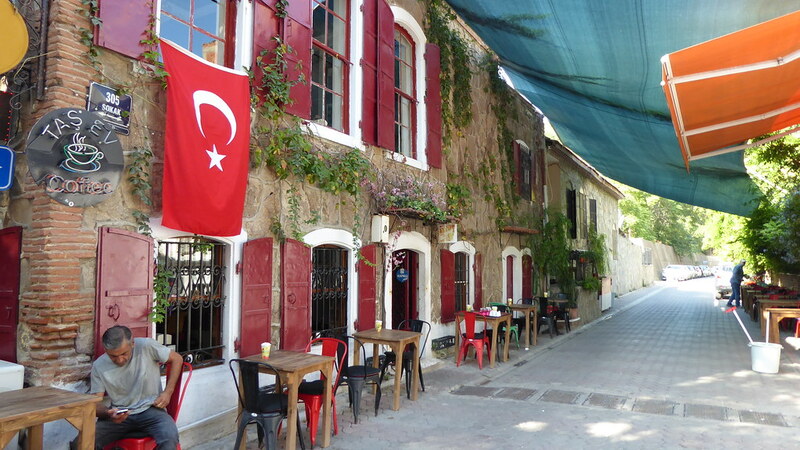 We would come back to Konak later, but first went to a neighboring area called Karataş. Though I would assume it has a far far older history, in terms of modern urban development this area first began being settled and built up in the 1800s. It quickly became the second (modern) Jewish neighborhood of Izmir, and by the 1880s-1890s, a significant portion of the Jewish community of the city had moved to Karataş, and received permission from the Sultan to build a new synagogue. That synagogue, built over a roughly ten-year period from 1907 until about 1917, is today the largest synagogue in Izmir, with seats for about 400 people. It is a gorgeous space on the inside, built according to a basilica plan, with the Aron Hakodesh (holy ark where the Torah scrolls are kept) and bimah (stage) at the front. Most of the other synagogues in the city, and indeed most I’ve seen outside of the US were built in a central plan, with the bimah in the center, though many were later rearranged to put the bimah at the front. Today, the building is pretty much only used on Shabbat, holidays, and for events such as wedding or bar mitzvah. Due to its size, beauty, and history, it is one of the chief locations in the city that people choose to host their Jewish weddings and bar mitzvahs today, but outside of those occasions, even on the High Holidays (Rosh Hashanah and Yom Kippur), we are told that sadly they may get only a few tens of people. Because of basic geographical considerations the building is not oriented to the east (towards Jerusalem). 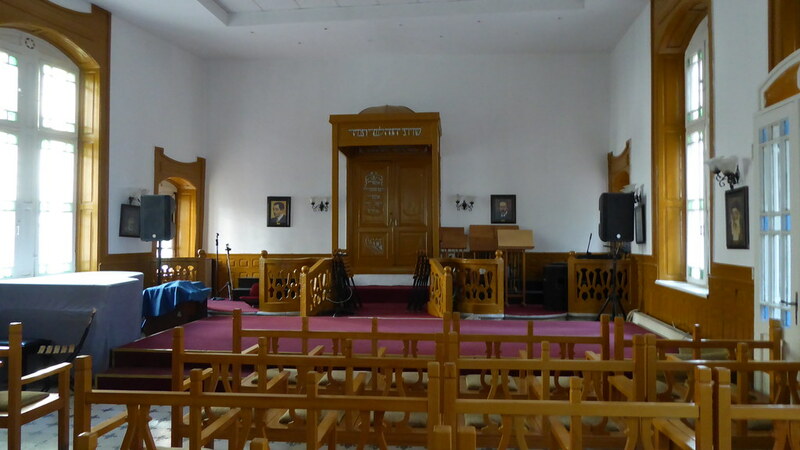 The Aron Hakodesh is to the South, and even though they read Torah there (facing south, with the readers facing north), various other parts of the service are performed facing east. Even though they haven’t built a second bimah or anything at all to that direction. Above: A view out over Izmir from the top of the Asansör. 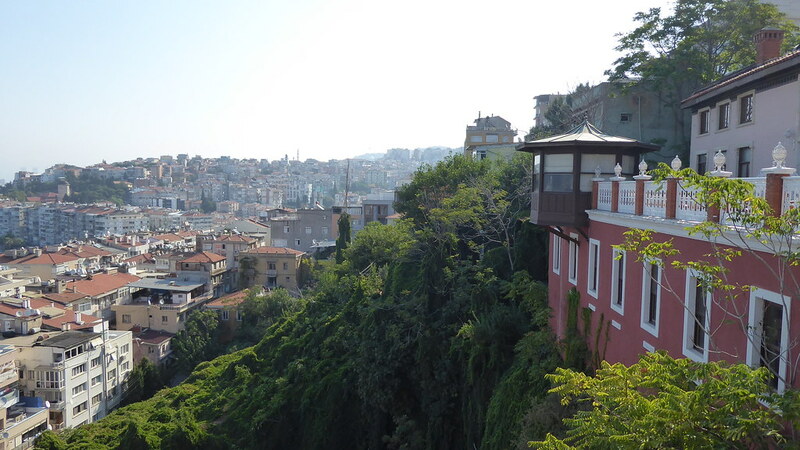 Walking a short distance from the synagogue, we came to an Izmir landmark known as the Asansör, or “elevator.” Nissim Levi and another Jewish businessman built the Asansör in 1919. I am not sure when the first elevators were invented, or what a steam-powered elevator might have looked like in 1919 Izmir, but it’s kind of hard to imagine. I mean, as a historian 1919 feels pretty modern; but, at the same time, it was literally one hundred years ago. I don’t think I realized that elevator technology in any form went back quite that far. 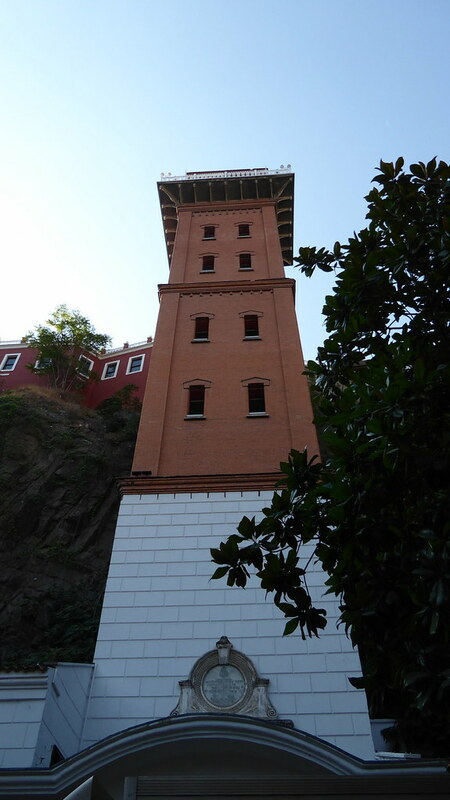 Now run by the municipality, and redone with totally modern elevator technology, use of the elevator, which provides quick and easy access between the areas of town high up on the cliffs and those down below, is now free. Originally, Nissim Levi had donated his house to become a hospital, charged fees to use the elevator, and used that revenue to help run the hospital. 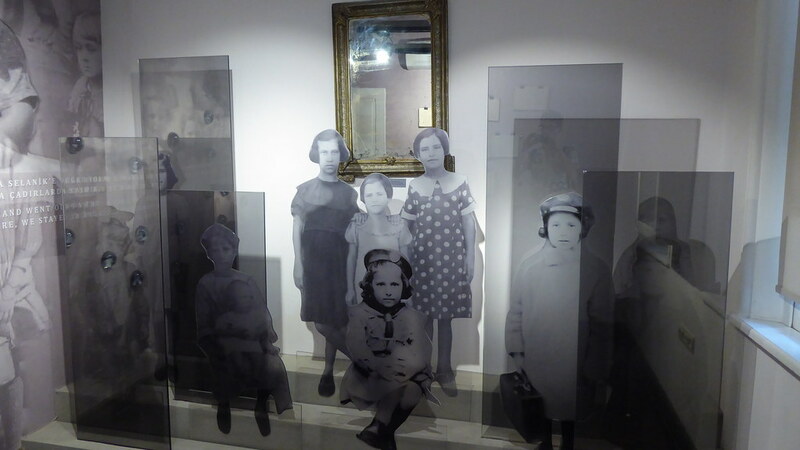 Sephardic Jews – descendants of those who were expelled from Spain and Portugal in the 1490s and settled in the Ottoman Empire and elsewhere – seem to have long been a prominent presence in Izmir. And even long long before that. There was already a significant community of Jews in the area, we were told, by at least the 1st century CE. Smyrna was, after all, a significant site in earliest Christianity, who were of course Jews. Others also came with Alexander the Great, or that is with his empire. This was the Romaniote community – Jews who trace their lineage and traditions back to ancient Greece. We can be very self-oriented and narrow in our perspectives as Ashkenazi Jews, and as the broader gentile communities in New York and elsewhere, thinking that Ashenazim (Eastern European Jews, like myself) are the default Jews, the primary type or category of Jews, the only Jews, or (particularly problematically) the only true Jews following the only true correct or proper version of halakha (Jewish practices). I had always had some sense about Sephardic Jews, coming from a tradition stretching back through centuries in Ottoman lands, Italy, or elsewhere, back to medieval Spain, and about Mizrahi Jews, whose ancestors had lived in Arab or Persian lands for centuries and centuries, in some cases of course stretching back to long before there was ever even such a thing as Islam or Christianity, and long before the Arab conquests of Palestine and so many other lands outside of the Arabian peninsula. I had also heard about Ethiopian Jews, Indian (Mumbai) Jews, even Jews from Uganda, Zimbabwe, and Peru. But somehow it had never occurred to me, and I certainly had never been taught, about the Jews who lived in Greece and elsewhere before even the Sephardim came. Of course they existed; of course they would have had a separate identity and traditions. And now, as bad as it is that the Sephardim and other groups are getting Ashkenazified in the US and around the world, and that the Ashkenazim, Sephardim, and indeed everyone is getting Israelified over in Israel – some new, specifically Israeli, form of Jewish culture developing and taking over as the “real” or “true” or most correct form of being Jewish – as bad as all of that is (and many Muslim communities in the Balkans and elsewhere are simultaneously being Arabized), how much worse for the Romaniotes! Side note, we also visited at some point in the last year or two a Greek synagogue in New York’s Lower East Side, the only Romaniote synagogue in the Western Hemisphere. And yet, rather than being able to strongly maintain and practice and pass on Romaniote traditions and identity, they have to struggle with/against the many Sephardic members of the congregation, whose traditions inevitably influence and alter their own. 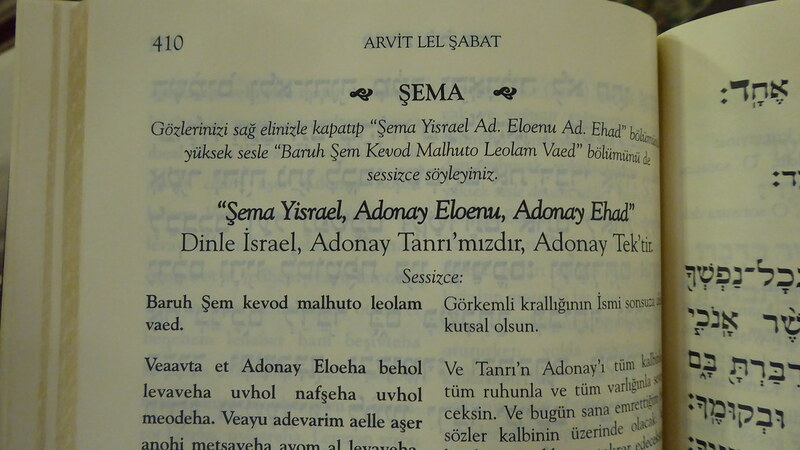 A section from a Turkish siddur (prayer book). Of course, Jewish prayer books come in all languages, but it’s always interesting nevertheless to see them. In Izmir, many Sephardim came in the 1490s-1500s, greatly boosting the size & strength of the Jewish community in the city but of course dramatically impacting the community’s cultural character as well. Ets Hayim (“Tree of Life”) is considered the earliest synagogue in the city that still exists. It is believed to have been built in the early 15th century, even before Sephardic arrival. We later returned to the winding streets of the bazaar area to visit another set of historic synagogues. The main streets of the bazaar form a semi-circle through the area, with everything else branching off from that. One of those branches is Havra Sokak – literally “synagogue street” or “synagogue alley.” It is full of grocers, fishmongers, all sorts of shops and stalls, and only a few synagogues. But four synagogues sit back to back with one another, perhaps the only place in the entire world where this happens. Today, all of these synagogues are in varying states of closure. Some take turns, being closed most of the time and being opened up for weekday services for a month or two, and then closed again while a different one is opened for use for a month or two. As someone who grew up in a synagogue that at that time had a very lively and actively community – minyan morning and evening every day, Hebrew school for the kids on weekday afternoons and Sundays, a good 50-100 people every Saturday morning – and in a region where almost every town had at least one synagogue that was at least that well-attended and many towns had multiple, I cannot help but feel this is a sad state of affairs. That so many synagogues should be in such disrepair and disuse. But, then there is the flip-side. These synagogues are still here; they haven’t been demolished or turned over to other uses. They haven’t been abandoned by the community, and quite to the contrary, with the help of the city, they are actively working to maintain, operate, and restore them, and to convert some of them into a sort of museum area, opening them up to Jewish and Muslim Izmir locals, tourists, whomever, to come and learn something about Judaism and about Izmir. A professor and his students from Helsinki (I didn’t catch the name) come ever year to work on restoration of old textiles, such as parochet (ark curtains). Şalom synagogue has been able to establish a climate controlled storage room for these precious textiles. And while I have no doubt that every Jewish community – every community of any kind – has its rifts and feuds, it seems like the core people at least work together to operate and maintain and use all of the synagogues; unlike how I imagine it would be in my home community, to be honest, where each synagogue is struggling on its own and no one really thinks of themselves as having any connection or belonging or association with any of the others. The first small synagogue we visited is called Bikur Cholim (“Visiting Patients”). The origin of the name is unclear, but the congregation may have been involved in organizing visits to hospitals or something like that. The building was donated by a Chavez family in the late 17th or early 18th century. It burned down several times and was rebuilt, and much of what survives today is from the 19th century. The Algaze Synagogue dates to 1724. It has a central bimah. The basement used to house a council of elders, providing them housing in exchange for them regularly praying for the well-being of the community, providing minyan, etc. This basement also houses a genizah, a place where papers and documents that cannot be thrown away or otherwise destroyed – anything with the name of God written on it, such as torn pages from old prayer books, for example – are stored until they can be ritually buried. Left: The entrance courtyard to Şalom Synagogue, behind a relatively non-descript metal gate from the street. In any case, we were told of another nearby synagogue, La Sinyora, which is no longer in use for religious events but is still used for community events. Another area called Foresteros (sp?) was at one time turned to use for kosher butchering, kapparot, etc. 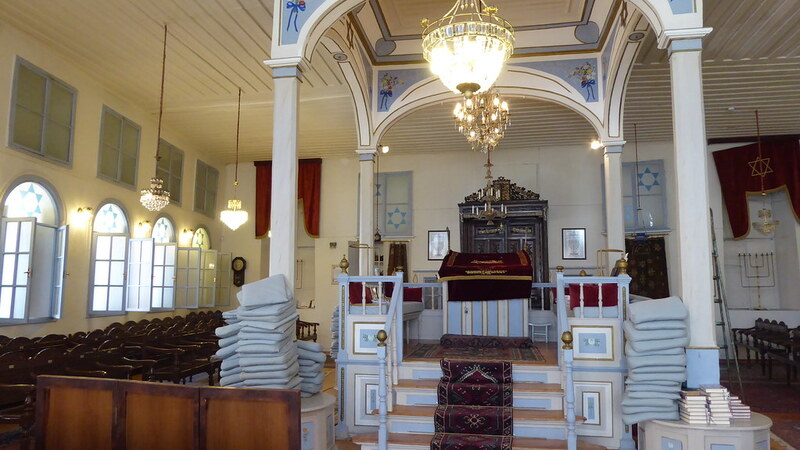 A synagogue known as the Portuguese Synagogue (no 8), fell out of use in the mid-20th c. It was loaned to the Aegean Young People’s Association for 25 years to use for social & cultural activities, with the condition that they restore it and also make it available to the Jewish community. Today it is in disrepair but is still controlled by the community and there are plans to clean it up and make it into part of the museum. Our guide pointed out a small area with ruined and graffitied walls, which used to contain within them the house and office of the chief rabbi. The building still belongs to the community but the land does not so it’s an ongoing problem. Right: Beit Hillel is a small space, so it’s hard to get a good shot of it. Another building in the immediate Havra Sokak area, known as Beit Hillel, wasn’t really a “synagogue” but a small house where people gathered to prayer. At one time, an earthquake and the ensuing fire destroyed much of the city, including 10,000 shops or homes belonging to Jews. The synagogues thankfully were mostly spared. But even so, with the community having such difficulties, some wealthy families gave over a room or a secondary house to the use of the community for prayer etc. Beit Hillel was one such place. It was given by the Palaci family. Hayim Palaci (b. 1788) was a great scholar, who wrote some 70+ books on religion, including many respuestas – answers to questions people might have as to correct practice, etc. Some of these books are still in very active use. He and his son Abraham Palaci (pictured) are buried in an old cemetery called Gülçesme, no longer actively in use today. A small sect of Hasidic followers follow his teachings in particular, and some 30-50 people come from Israel every year on the anniversary of Palaci’s death, and do whatever it is they do. Palaci was named a Minister of Justice (kadi) , one of the highest members of the Sultan’s Court in Izmir Province, able to hand down decisions on judicial conflicts or petitions pertaining not only to Jews but to Muslims or anyone else as well. 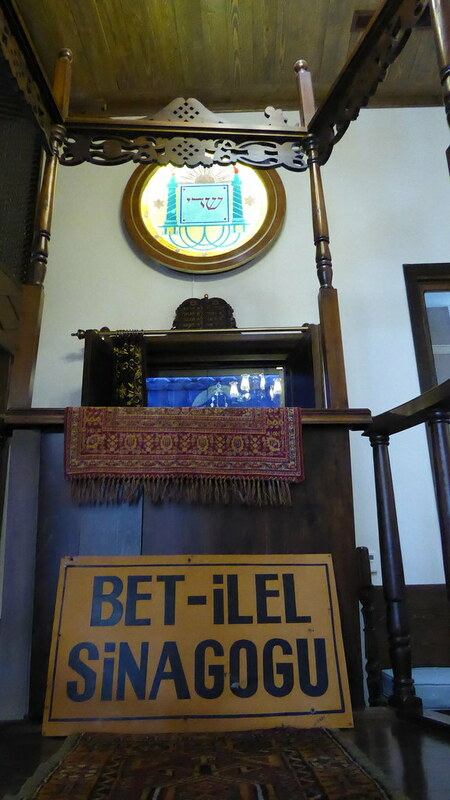 Beit Hillel is today a “memory house.” Not quite a museum, but housing some displays and objects. Since all the synagogues are normally closed except when actively being used, this house, open regularly, provides a little bit of an opportunity for any Muslim or anyone else who’s interested to learn just a little something, some sense of what goes on in a synagogue. And to learn something about the Palaci family and that particular story. 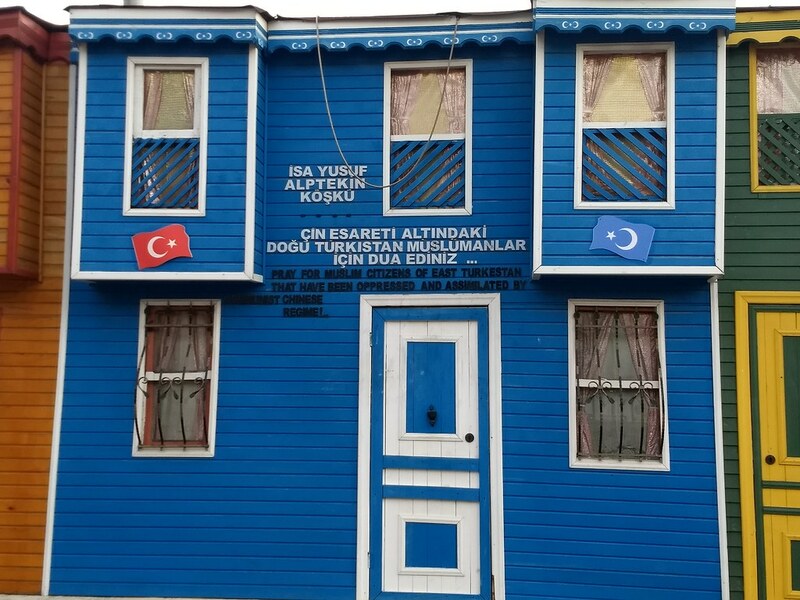 Meanwhile, the Ashkenazi community in Izmir grew over the 19th century, and built its own separate shuls, schools, butcher shop, etc. But then after 1919, many left. The Ashkenazi synagogue was forgotten, and rediscovered only more recently. Today, the entrance is blocked off, but is labeled. One of the many han (caravanserai plazas) in Kemeraltı. Returning to the bazaar, we were introduced to several “han” – like caravanserai, but small ones located within a city. Historically, these were enclosed plazas where merchants could leave their horses, camels, etc., and then on the second story, all around the plaza, were inns where the merchants could stay. 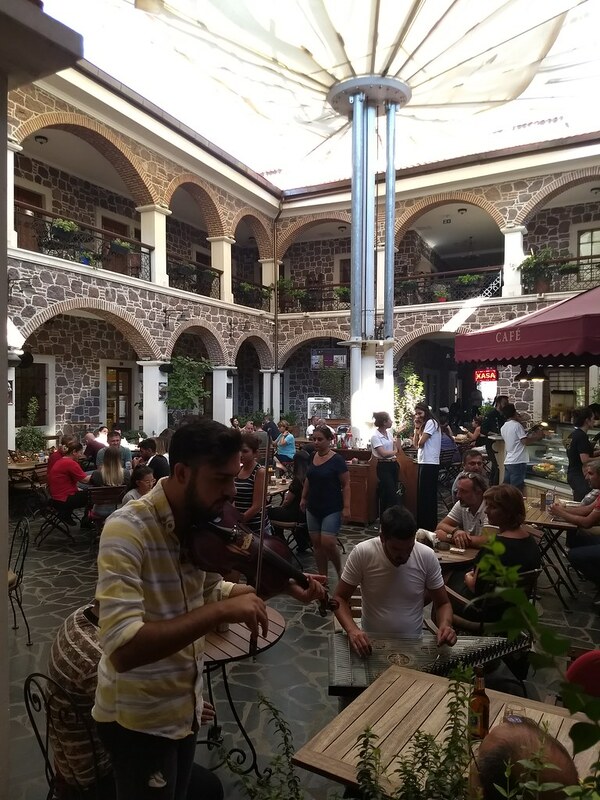 Today, we walk down the bazaar streets and from time to time find an opening, an entrance into one such plaza, today used as open-air restaurants or bars, sometimes with live music. I would not be surprised if the second and third story rooms are still today used as hotels or the like. 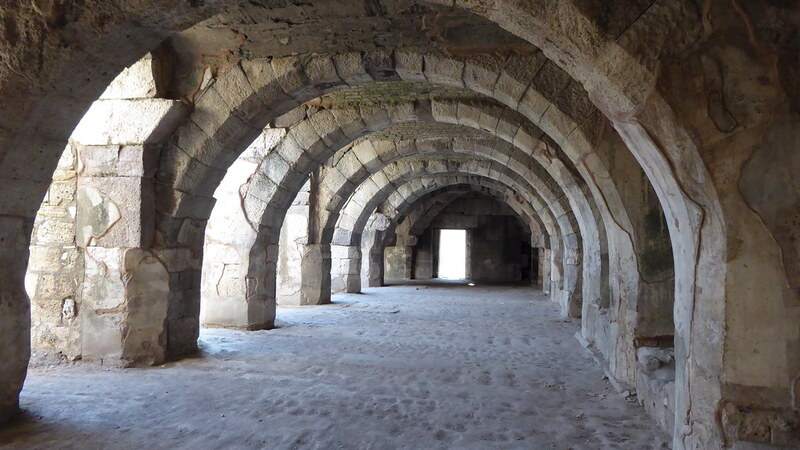 Finally, we went to the ruins of the ancient agora (main marketplace) of ancient Greek Smyrna. Today, large sections of it are excavated, and are maintained as a public park. Professors and their students continue to actively work on the site, gradually excavating more and more. There were plans at one time to build something in the site, some sort of cultural displays or cultural center, but for the time being that seems to be on hold. The agora was destroyed in an earthquake sometime in the 2nd century CE. Marcus Aurelius had it rebuilt in honor/memory of his wife, who loved Smyrna and who had recently died, and her picture can be seen on the archway. 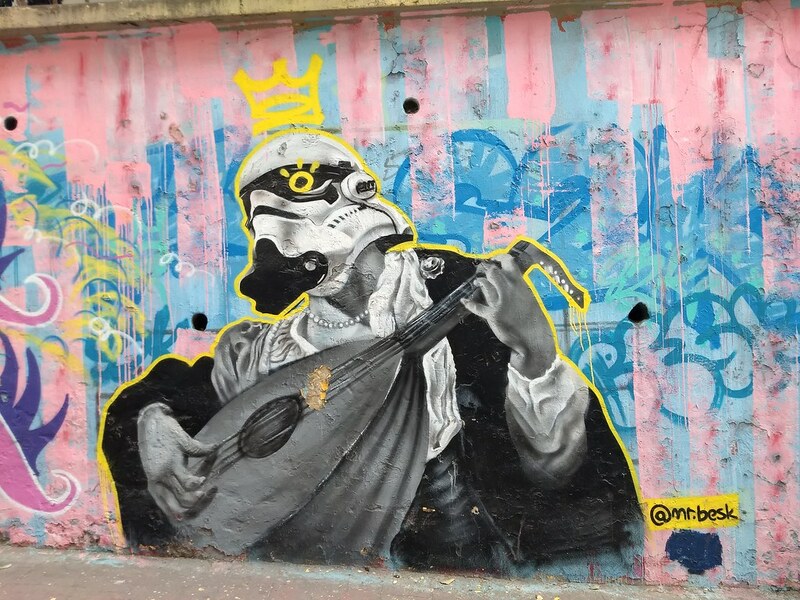 In western Anatolia, esp. southwestern Anatolia, we were told, the ancient Greek influence or identity was so strong that Latin never really replaced Greek language entirely. Even well into the Roman period, inscriptions continued to be in Greek. As someone who never really studied Greek/Roman history, I learned a number of interesting little things about their architecture. Terracotta water pipes were made with holes covered over with lids. They could then unseal a lid to clear blockages in the pipes, without having to replace entire lengths of pipes. Ancient Smyrna featured main shopping avenues of tiny showcase shop spaces. And sections of columns and sculptures were often held together with metal joins, which were poured in through small channels carved in the side. I had always wondered about that – you can’t make such statues, with outstretched arms and so forth, without some kind of supports, right? So, let’s see. How to sum up? Izmir was an interesting time. The only Turkish city outside of Istanbul I’ve yet visited; definitely had a different vibe, but not too different. Really cool to get to see more music shops, indeed a whole (small) Museum of Musical Instruments which contains a working luthier workshop; we actually ended up meeting up with some of the instrument-makers based there and got to visit their master’s workshop as well. I love how these workshops are so often hidden on the second story of nondescript buildings – just like in Kyoto and in so many other places it’s just such a wonderful feeling to think about how much more is going on all around you, behind the scenes, that you wouldn’t know about. We did miss out on going to any meyhane (live bars). But on the other hand, we got to have some boyoz, a distinctively Sephardic food which has become widespread and mainstream (only) in Izmir. I still kind of can’t believe that I’ve been to Turkey, period. But now that I’m with someone who’s so involved with Turkish music and culture, I’m definitely looking forward to going back to Turkey with her, and maybe visiting some other parts, such as Edirne, and maybe even Cappadoccia, the Black Sea region, or even Kurdistan. We’ll see. 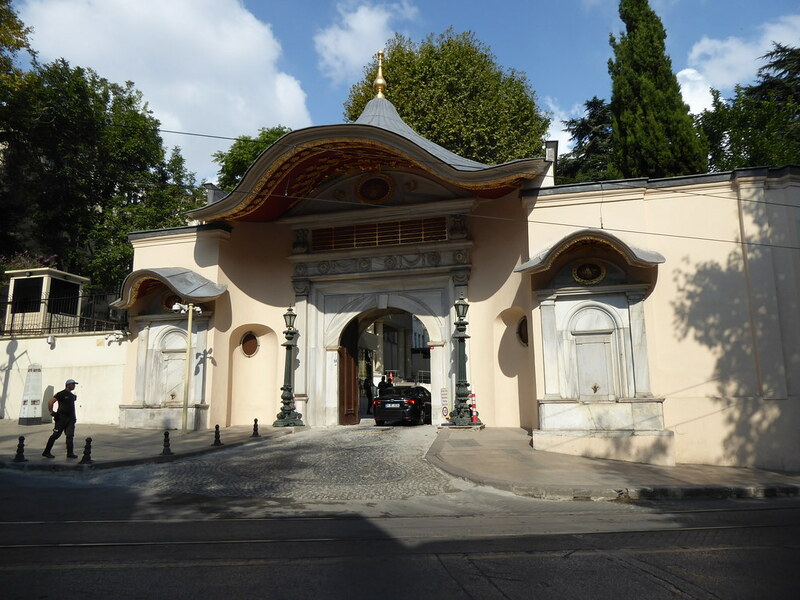 One of the major gates within the Topkapı complex. Topkapı Palace is an interesting place. Having missed it on my earlier trip to Istanbul, I was going to make sure to see it this time. I was especially interested because one piece of my research had been considering the physical layout and arrangement of the Shogun’s Grand Audience Hall (Ôhiroma) at Edo castle, in Japan, and I thought that Topkapı, as the palace of another great non-Western empire, could make for an interesting comparison. Or could provide insights that I just couldn’t get from the scholarship on Japan. 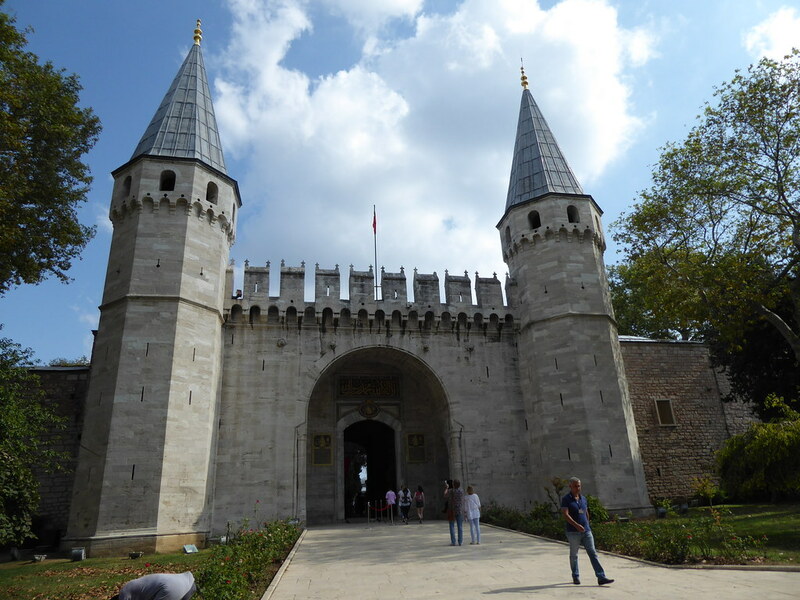 Topkapı is also of interest for its extensive collection of Ottoman artifacts. As it turned out, I am sorry to say I found the palace a bit of a disappointment. I think that if/when I go back, I’ll try to get a tour guide, hopefully someone who can give a fuller explanation of how the rooms were used, why they were arranged the way they were. It’s an incredible, very impressive set of spaces, no doubt, and many of the rooms are lavishly, very impressively decorated with tile and so forth. Beautiful. Gorgeous. Very palatial, and in a distinctly Ottoman way; this was an earlier palace, quite unlike what I imagine Dolmabahçe Palace – inspired by Versailles, and by the modern/Western trends and pressures of the 19th century – looks like. But, sadly, I really didn’t get a sense from the map pamphlets, or from the plaques on the walls, how this palace was used in an administrative, governmental, or ritual way, so much as just a focus on its artistic beauty, craftsmanship, and the lavish lifestyle of the sultan. The Inner Palace Library of Ahmed III. The collection was interesting, though frustratingly they didn’t allow photos in most of the exhibition rooms. It was neat to see weapons and other historical artifacts directly associated with some of the most historically famous or significant sultans – objects not only beautiful in their craftsmanship and artistry, but of historical note as well, such as the sword of Mehmet II, or the sword and bow of Bayezid II. The palace collection also included a number of items from other cultures, many of which I imagine were formal gifts from foreign rulers or governments. This included a sword belonging to Stephan the Great of Moldavia, several *huge* Hungarian greatswords, and several Japanese swords. While one of the Japanese swords bears the imperial chrysanthemum on its lavishly decorated gilded scabbard with purple velvet ropes, the rest had ivory scabbards which looked to me, if anything, like export art, not imperial gifts. But, then, I could be wrong. The “Inner Treasury” exhibit was… well, it was something. 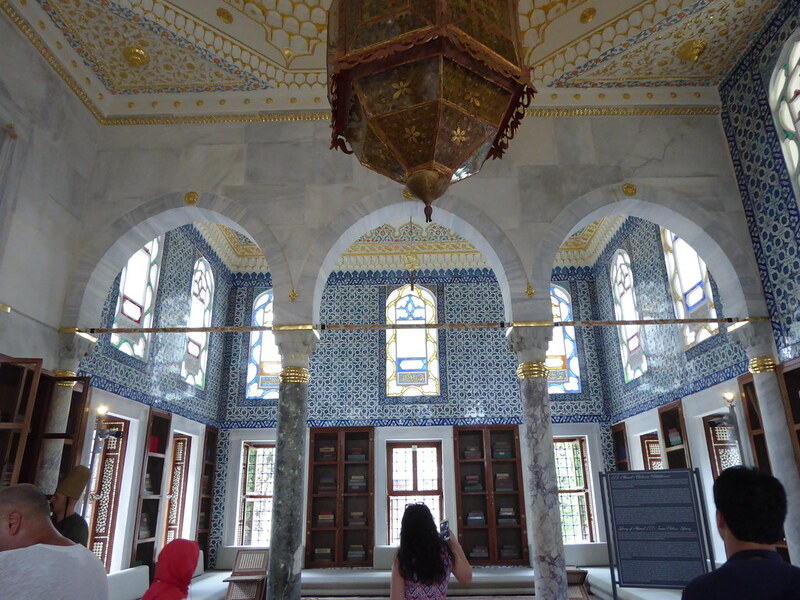 If I hadn’t been told about this ahead of time, I would not have expected Topkapı to house such a room of such absurdities. They claim to have the sword of King David himself, the turban of the biblical Joseph (Yusuf), the staff of Moses, and of course numerous relics of the Prophet Mohammed. King David, of course, having ruled sometime around the 10th century BCE, not only is it fully unbelievable that his sword – even assuming it survived at all – should be in such good condition, but further, whatever a 10th century BCE sword should look like, this one seemed far too similar to a medieval sword in style; clearly an absolute anachronism. The turban and the staff, similarly; I can’t judge style, but both lived many many many many generations before even King David. Wikipedia suggests that Joseph, if he did live, lived sometime around the 1500s-1440s BCE. Did people wear turbans back then? Of what style? What’s the story behind these treasures, I wonder. When we’re they made, or obtained, and for what purpose? They’re so obviously fakes, what’s the point? Or, is it so obvious? I really wondered what so many of the tourists around me, Christians and Muslims most of them, what they thought about all of this. How many see them as real religious relics, as something they’ve been so honored to get to see? Since I don’t have any photos of the Inner Treasury, something completely different. A gate known as the Sublime Porte, a metonym for the Ottoman government as a whole. Another set of very interesting and much more plausible artifacts pertained to the Kaaba, the most sacred site in all of Islam. Located at the center of the most sacred mosque in Mecca, it is strikingly iconic for its relatively unadorned black square form, and for the masses of pilgrims regularly (constantly?) forming circles around it. It’s easy to think of Turkey as an outlier on the margins of the Muslim world – Turks aren’t Arabs, after all. And, to be sure, Turkish history and Turkish culture are distinct from that of the Arab Middle East in all sorts of ways. But, what I hadn’t known is that for centuries the Sultan of the Ottoman Empire was regarded as the chief (or sole?) Caliph of Sunni Islam. We learn that a stone supposedly placed by the prophet Abraham (Ibrahim) marks the location of the circumambulations, even if the Kaaba itself is damaged or under repair. This stone was damaged by catapult stones during the Umayyad siege of Mecca in 756, but was repaired with silver. It broke again in the 17th c, but the Ottoman sultan had it gilded and repaired with lead and silver. We are also shown items claimed to be the swords and bows of the Prophet Mohammed himself. Hard to know what to think, but I suppose I could actually believe this, since they’re hidden underneath later scabbards and cases and so forth, and since Mohammed lived far more recently than, for example, King David or Moses. So, it could be. 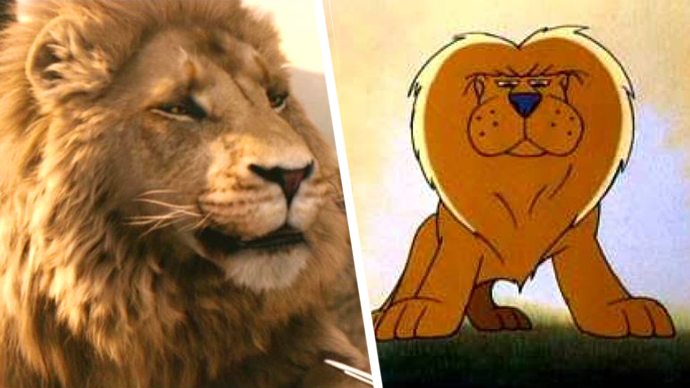 Of course, even so, it seems just a bit too unlikely for these things – and his beard hairs, teeth, etc – to have actually been passed down and passed down and never lost. Then again, it was the 7th c CE, not super ancient times. If Japan can retain things from such a time, then I suppose Islamic civilization could too… Even despite all the wars and conflicts, from one sultanate or caliphate to another. maybe? I wonder if any of my readers might happen to have insights on this? In the very last room, we finally get to 16th c. objects – letters and documents from Sultan Selim, and a large royal banner. Much more believable. I’m honestly not sure what I expected from visiting the palace. I guess I was hoping for something which might more explicitly compare to, for example, Edo castle or Shuri castle, so that I might find something interesting in similarities or differences in how foreign delegations were received, how court ceremonies were conducted, etc. But you get very little of that at most historical sites, actually, right? Shuri has models in the gift shop of New Year’s celebrations and investiture ceremonies, both of which (alongside live reenactment events and scholarship) have been very informative and inspirational for me, but the castle itself, in its explanatory plaques and such, doesn’t really give visitors all that much of a sense of it. And Edo castle, of course, has nothing at all, since the entire Honmaru – the main section of the castle, where the shogun’s audience halls, meeting rooms, administrative offices, etc. were located – burned down in 1863 and was never rebuilt. As I’ve mentioned in a previous post, it is now just an open public park area, just grass, while most of the rest of the castle grounds is now the Imperial Palace and is off-limits to tourists. Thankfully, though, the Edo-Tokyo Museum, among other places, has models and other sorts of recreations of what had been. Nijô castle in Kyoto has been perhaps the best of the places I have visited, really talking about who would be received in which rooms etc., and even going so far as to display mannequins arranged in the main audience hall to show how lords would have been seated, and what the room really looked like when it was in use. 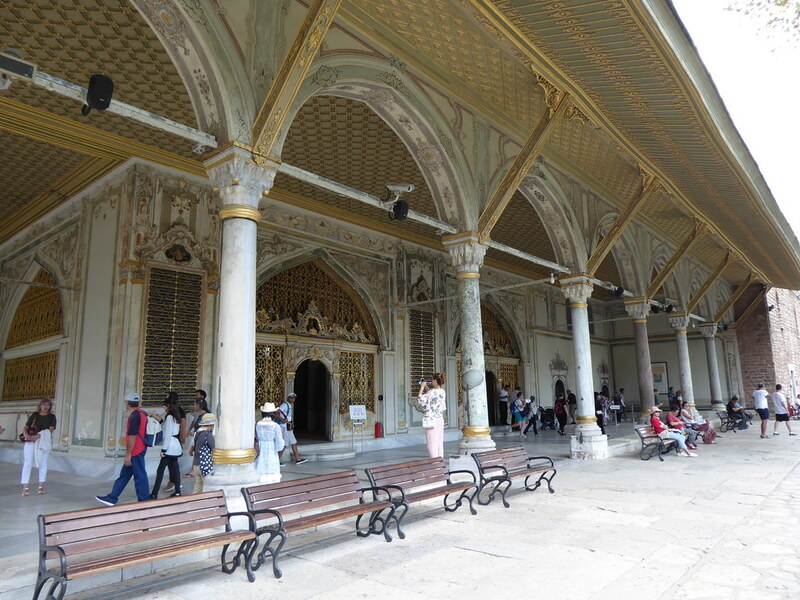 But here at Topkapı most of the palace rooms have been converted into museum galleries, displaying paintings or arms & armor or religious relics of questionable veracity, so we don’t get as much discussion as we might of how ceremonies or court business was conducted. Then again, it might be simply a matter of reading about it ahead of time. Had I read Gülru Necipoğlu’s book about Topkapı more extensively before going there, maybe I would have known what to look for better. Certainly it was because of my knowledge of Edo, Beijing , and Shuri, from a combination of experience and study, that I understood the Korean palaces (which I visited in June 2017 and realize now I still have never blogged about) better. The exterior of the Imperial Council Hall. A plaque explains how the space would have been used, but that’s about it. A few final notes, small things I found interesting. One label in the Palace Kitchens section mentions a Polish page, Ali Ufki Bey (Albertus Bobovius). Apparently, according to Wikipedia, he wasn’t merely a page, but actually became one of the most prominent or influential musicians and dragomans (interpreters/guides) in the 17th century court. One wonders how common this was, and how diverse the court. 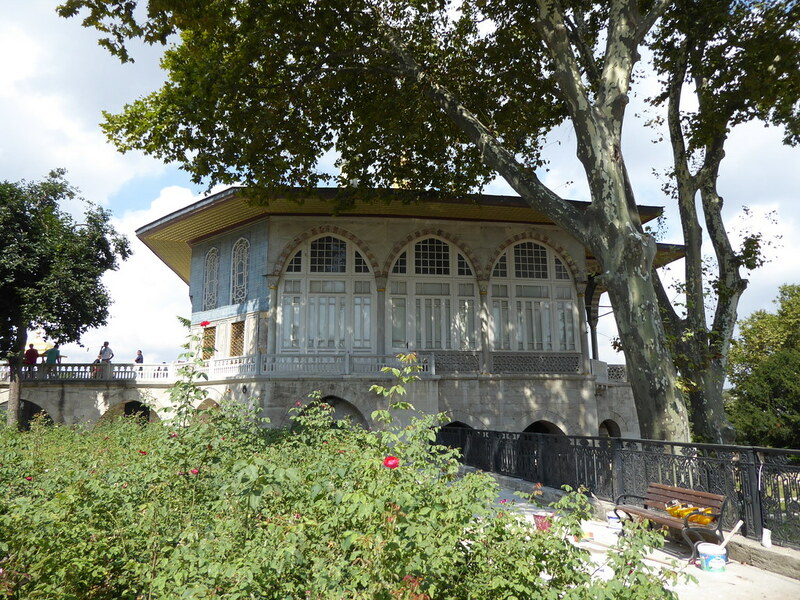 Some 4,000-5,000 people lived/worked at Topkapı in the 16th century, and the number rose to 10,000 in the early 17th. The palace chose the finest fruits, vegetables, meat, grains, etc from all incoming ships or caravans, before the remainder was allowed to go to the people of the city. Tons of Chinese porcelains, celadons, etc. 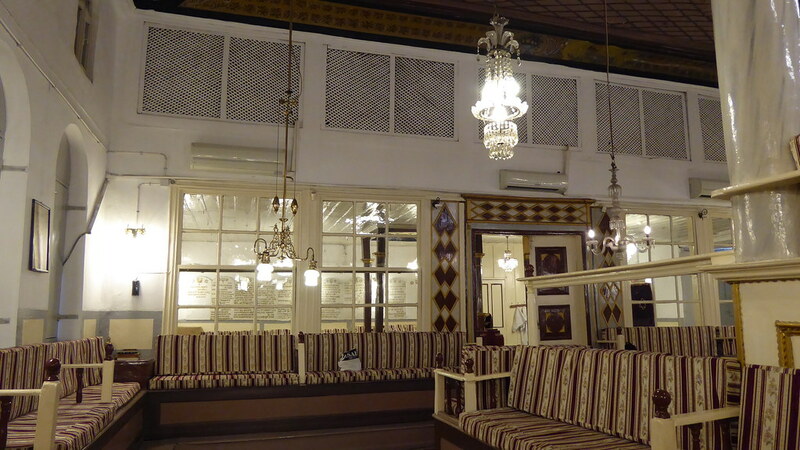 were used in the Ottoman court, alongside Persian ceramics, Turkish metalware, etc. I suppose I should not be surprised at this, but nevertheless it is interesting to see, firsthand, in person, the incredible extent to which Chinese goods (not ugly “export art” goods like we see in so many Western museums, but nice, good, blue and white porcelains) were integrated into the everyday courtly material culture. The newly reorganized Islamic Art galleries at the British Museum (which I would visit in November) reflected the same. 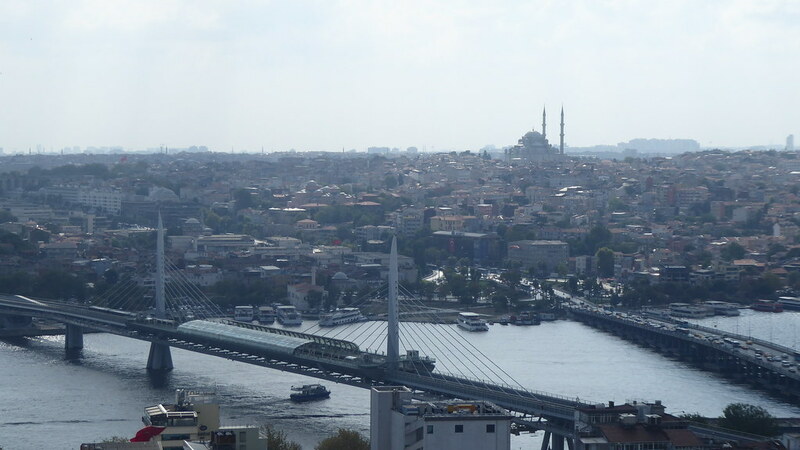 A view of the Istanbul skyline from the top of Galata Tower. Having finally finished my posts about my Japan travels in summer 2018, I can now move on to talking about what I did with the rest of the summer. I know all of this makes it seem like I’m doing so much traveling, and I guess I have been; but since the summer it really has been mostly just buckling down and working. And a few conferences here and there. 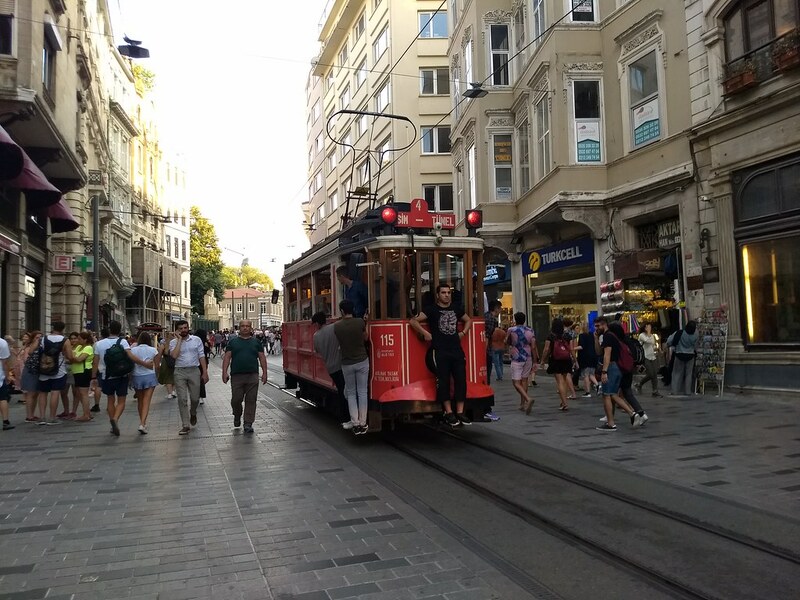 Istanbul is a fantastic city, much like a dozen other places I would love to visit or try living in, from Dublin to Copenhagen to Brussels to Amsterdam to Berlin to half a dozen places scattered across the Balkans. It’s no Kyoto. I find myself much more comfortable, much more in my element in a certain sense in a place like Kyoto than Istanbul – not just because of logistical conveniences like the fact that I know the language and the culture better, but also because this is a culture which for the better part of the last 20 years has spoken to me. Walking along the Kamogawa, hearing shamisen music, seeing wooden machiya, makes me smile makes me happy in a way that the Istanbul equivalent does not. It’s just not my thing, in the same way as Japan doesn’t spark that similar excitement in my girlfriend, who studies Turkish music and who loves Istanbul. But, all of that said, I loved living in Istanbul, and I miss in particular the experience of constantly learning new things. 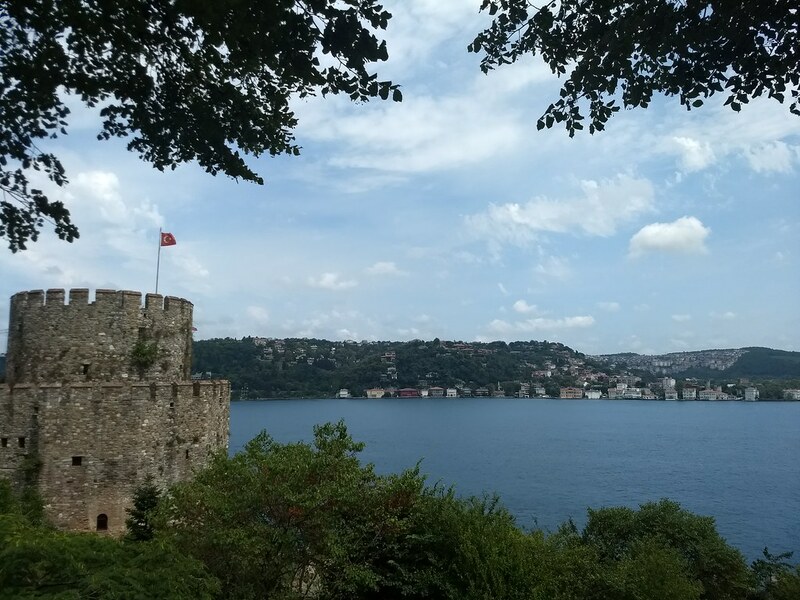 Living in a city I never expected to even visit, I learned a handful of words in Turkish, learned about foods and places and all kinds of things I never would have been exposed to otherwise. And now I can come back here to my life in the US, and bring back a certain bit of knowledge, experience, which I never had before. I also love the feeling, or the idea, of having favorite restaurants in faraway cities. Living in the Cihangir neighborhood, we had several of the best breakfast places in the city right at our fingertips. Van Kahvalti Evi is probably the best, but we went a number of times to places like Kahve 6* and Cuppa Cafe as well, all within super close walking distance. Though I never really took full advantage of it, it would have been an excellent neighborhood, too, for just picking cafes to sit and do dissertation work in; I did that a couple of times at a cafe called Journey, one called Kronotrop, and also at a chain place called Espresso Lab once on Istiklal (one of the most main shopping boulevards in the city). 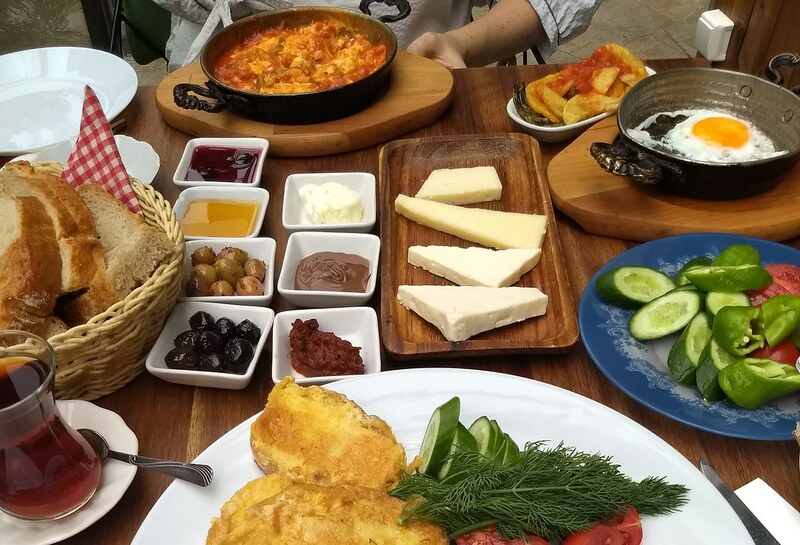 Breakfast at Cuppa Cafe, including menemen (eggs w/ tomato & pepper), fried eggs, vişne reçeli (sour cherry jam), nutella, acuka (a spicy pepper paste), bal kaymak (honey and clotted cream), several kinds of cheeses, cucumber, tomato, bread, pişi (fried dough), and of course çay (tea). Not pictured: tahin pekmez (tahini + grape molasses). I guess before I go on I should talk about Turkish breakfast. I happened upon an article recently, long after coming back to the States from Turkey, which said something like “Turkey has the best breakfast in the world, hands down.” And I think it’s true. I mean, I thoroughly enjoyed a nice tea and crumpets on my last trip to London (to be discussed in an upcoming blog post); somehow despite living in London for a whole year (way back in my very early grad school days), I somehow never discovered the wonders of jam and clotted cream and a good cuppa. … And I’m plenty happy with the kind of breakfasts I scrounge together for myself when I’m in Japan – most often, steamed buns or egg salad sandwiches or something like that from the convenience store; really, more like lunch food I guess than “breakfast,” but so it goes. But in Turkey we were enjoying a real proper breakfast – basically, the experience of a nice Sunday brunch in San Francisco or Brooklyn, but affordable, and every day. 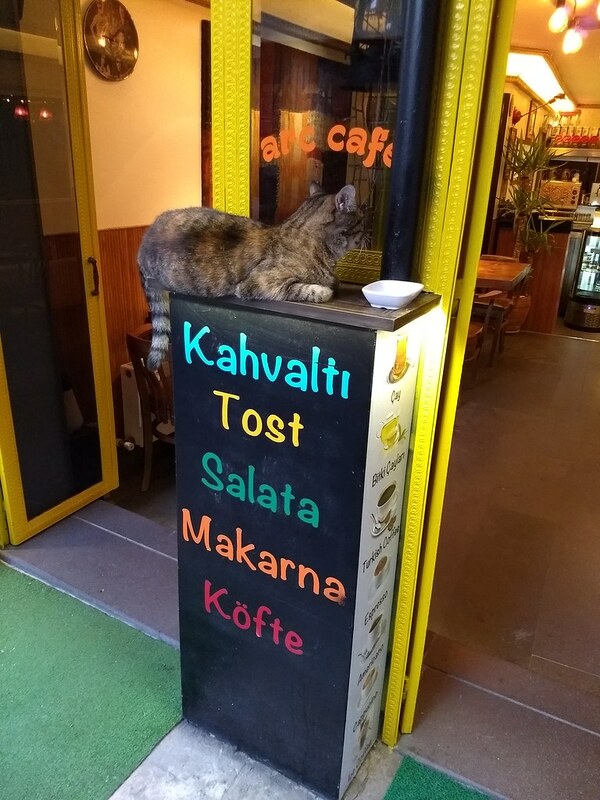 Kahvaltı (lit. “before coffee”) just means “breakfast,” but kahvaltı tabağı (“breakfast platter”) means eggs, several kinds of cheeses, some nice cut-up tomatoes and cucumbers, at least one kind of jam (I think the vişne / sour cherry is my favorite), clotted cream + honey (bal kaymak), and a mixture of tahini and grape molasses (tahin pekmez), along with plenty of bread to eat it all with, and at many places, free refills of Turkish tea (çay). We also often ordered menemen, a dish made chiefly of eggs, tomatoes, and bell peppers. So damn good. We also discovered a chain called Midpoint which had surprisingly excellent pasta – like, seriously, amazingly amazingly good, not to mention nice atmosphere and a cool menu. Midpoint is like one of those fancy restaurants you might want to go to at the shopping mall but never do because it’s too expensive. 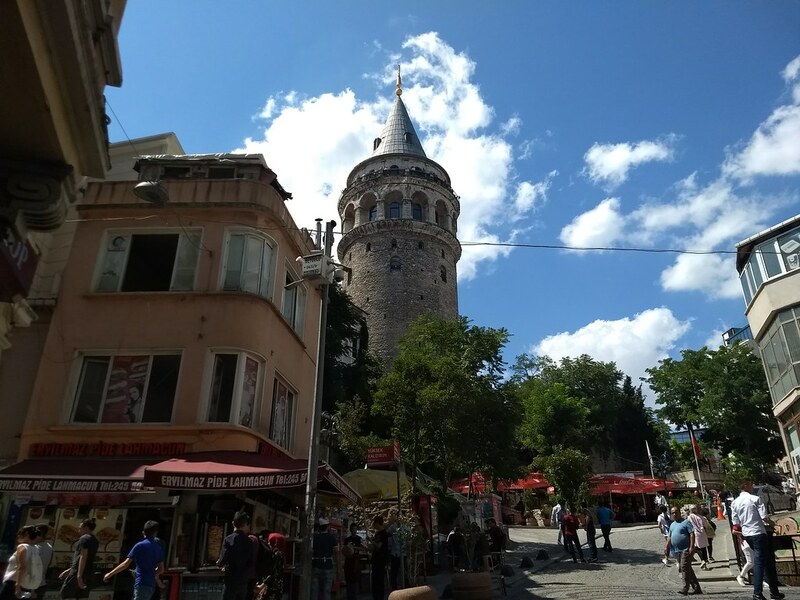 Galata Tower. Built in 1348 by the Genoese, roughly a century before the Ottomans (Turks) took the city. And it’s still standing and looking beautiful. I have to admit, I do think that a lot of the appeal of Istanbul for me came from the fact that it was so affordable. Because of basic purchasing power parity (it’s a poorer country, and so things are cheaper there overall; the US dollar, or Euro, or British pound, goes a long way) and all the more so because the Turkish lira tanked while we were there, going from roughly 4.5 lira to the dollar to closer to 7 more or less overnight, we could live so much more comfortably than we ever could here in the States. Living in a nice apartment, going out to nice cafes and restaurants all the time, and not having to worry too much about how much we were spending… It wasn’t pennies a day by any means, and it’s not like we were absolutely living like kings, but to be honest, just sort of living the nice sort of “young people in the city” sort of life that so many TV shows and movies have taught us should be within reach (look at, for example, the kind of apartments people live in on Friends or New Girl, or in movies like Julie & Julia). Clothes were suddenly what I would consider a normal reasonable price – closer to $15-20 per shirt or pair of pants, for example, instead of $60-100. 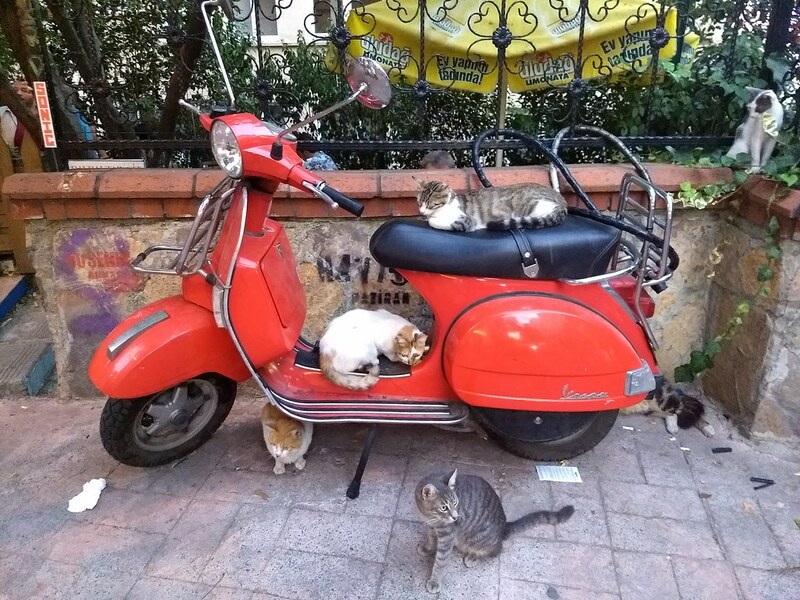 And it just means getting to spend time in the nicer parts of town, like Beşiktas and Nişantaşı, and, again, trying out nice cafes like Yeşil no 11, and buying new (knock-off) Birkenstocks without having to spend hundreds of dollars on them. It also means that little nice features of life, like getting your clothes tailored or your shoes or luggage repaired, suddenly becomes affordable enough (more than affordable! actually, really quite inexpensive indeed) that you can do those things. And order a drink, appetizer, salad, and/or dessert with dinner without constantly constantly feeling like you need to hold back and watch your spending like I do at home. But, I feel bad for thinking that that alone should be the reason I should love Istanbul. I mean, it’s a great thing for living a decent cosmopolitan life to be affordable. But I don’t want to think that I didn’t or don’t love the city for its own distinctive culture and history as well… But, while I sort of waver and worry on that point, I think overall I’m safe. I’ve been to Morocco and Jakarta (Indonesia) as well in the last couple of years, and while things may be more affordable there, I really can’t imagine enjoying living there for any real length of time, unlike in Istanbul. 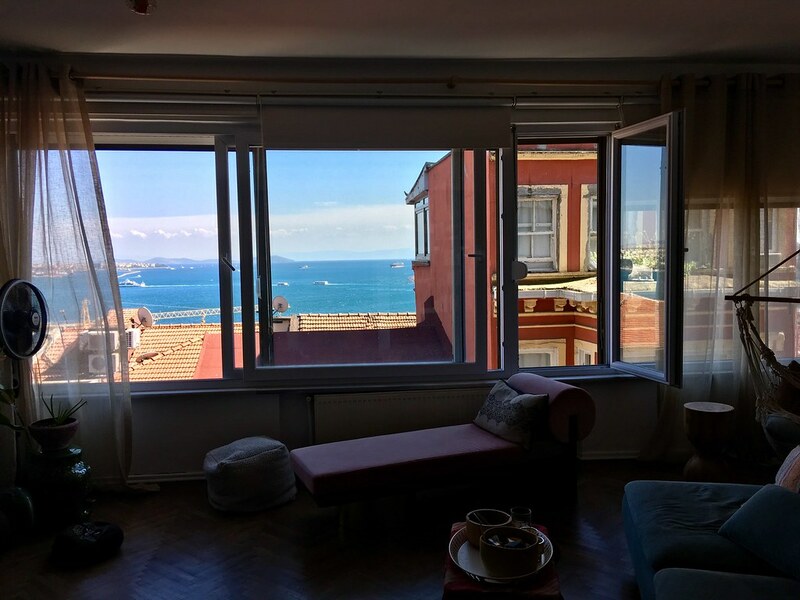 The view from our apartment in Cihangir. Photo courtesy of my partner. 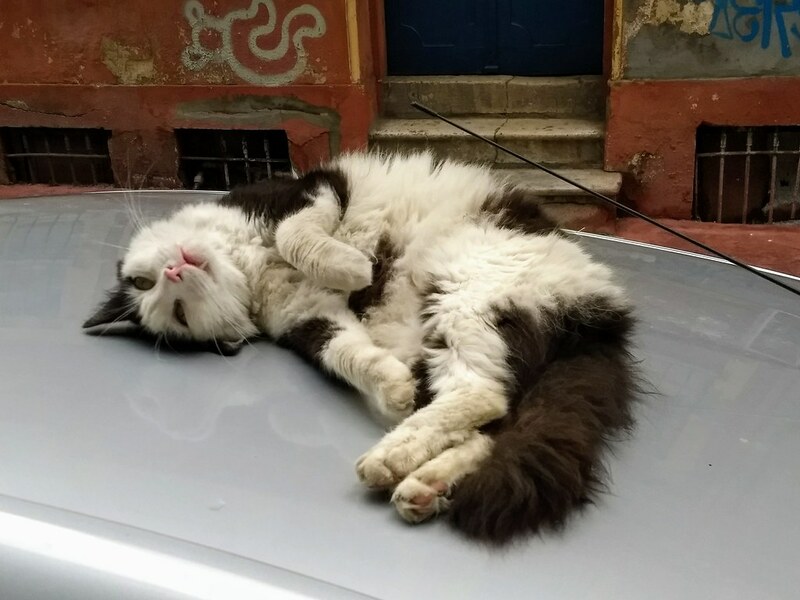 I’ve been thinking about it lately, and I am not really sure what kind of experience I might have had if I had gone to Istanbul by myself. I’m not sure what kind of experience I would have if I went back there again by myself. So much of what I enjoyed about the city was because I was with my girlfriend, who had been in the city for about two months already by the time I got there, was studying Turkish, and is super into and knowledgeable about Turkish music and a whole lot else; I don’t think I would have ventured into nearly as many bookstores, CD stores, music venues, without her. More to the point, I just don’t think I would have had any idea where to look to go, where to try to go. 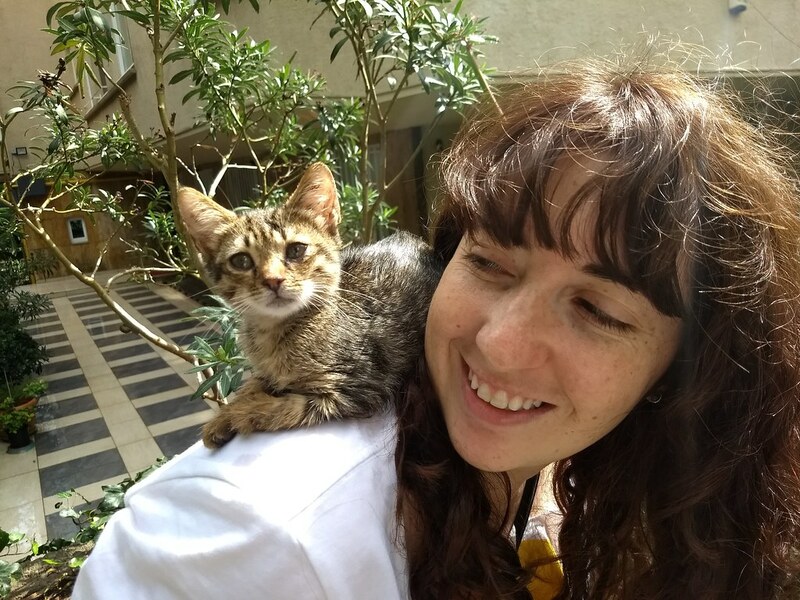 If I had for some reason found myself in Istanbul without ever having gone with her – like, if I had never met her but then ended up going to a conference in Istanbul, for example, I don’t know that I would have ventured much past the most standard tourist sites. I certainly never would have experienced the city as fully as I have now, after living there for six weeks. I wonder what it would be like if I were to go back again on my own – certainly I have a stronger sense for myself now of a lot more of the neighborhoods and such, beyond just the touristy parts, and I have some sense of which shops and which brands to look for, which foods I like, and so forth; how to get around by subway, bus, and ferry boat; and a very few key words of Turkish (which, who knows how long I’ll still remember…). But even so, traveling alone is so different than having someone to go shopping with, to go to breakfast and dinner with, and so forth. To go on errands, as it were, seeking out a tailor, or the best cheapest produce, or other things… A certain way of exploring and experiencing a city that’s quite different from being there as a tourist. And so much of the book, CD, and clothes shopping was for her – though some was definitely for me. I wonder, if I were to go back, would I be able to feel I was getting anything out of going into some of these shops, or would it just feel empty?